Amaltea looks up as the Star Glaesen approaches the landing. It has been a long time since she came to visit. The ship finally docks and she is amazed at all the new faces...and some familiar faces not so young anymore. She uses the wind to carry her whisper to Khyle, telling him to meet her at the town square. Khyle is so happy to see his wife that he almost bursts. They talk for hours about what they have been doing, about their friends and relatives. They also spend time with some of their friends. Amaltea has missed them all. Later that night she tells Khyle she is leaving for Teras again. "But before I go, I have something for you." Amaltea takes a small box from her satchel and hands it to Khyle. Khyle looks at her quizzically and asks, "What's this?" "It's a present, silly. Open it," she replies, smiling. Khyle opens the box, and from it he removes an oval-shaped silver locket. The locket is delicately encrusted with two tiny figures holding hands: an emerald ranger and a gold cleric. Behind the locket, engraved in fine script, are the words "So you can remember me when I'm not around. Your wife, always, Amaltea." Khyle opens the locket and is rendered speechless. Inside is a miniature portrait depicting in exquisite detail the image of his half-elven wife. She has gorgeous, long braided white hair and captivating violet eyes. 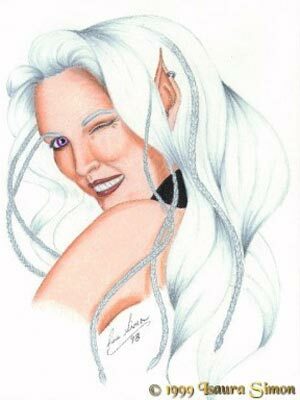 Her hair covers half her face as she looks over her shoulder with an impish smile and a wink.